Flames of War Vietnam — Is Back?! Beasts of War dropped some major news today by releasing a shot of a whole slew of Battlefront Flames of War Vietnam boxes. This not only includes the Vietnam figures we saw released in 2010 but boxes of Cobra, M-48, M-551, M-113, ACAV, M-106, and more. This is very exciting but we do wish they would release Pacific WW2 figures before going off on a new era in a big way. But I guess we won’t complain too much. Releases should start in the next few months. Also see, Flames of War — Refighting the Battle of Ia Drang. 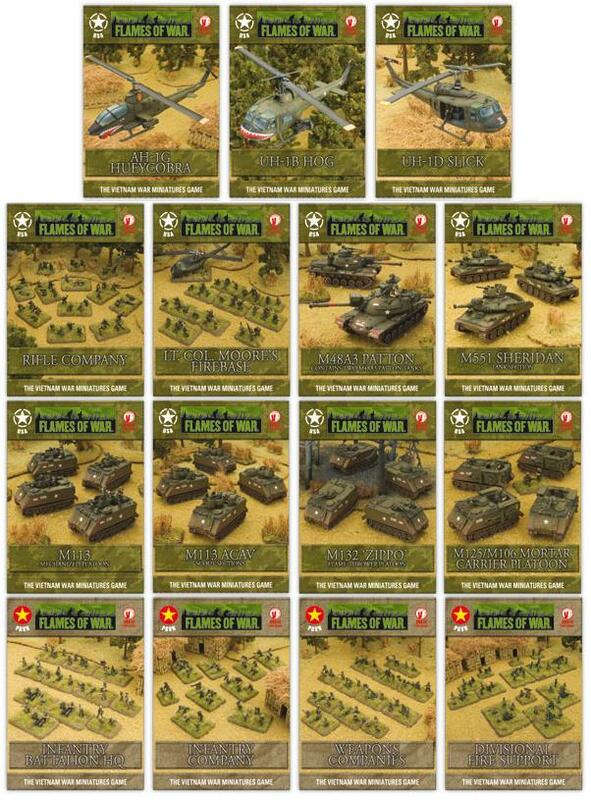 Wargames Illustrated #282 will feature Tropic Lightning, the return of Flames of War to Vietnam. It will include a free 48-page booklet dedicated to FoW Vietnam army lists and rules plus terrain and modeling tips. Available March 26, 2011. Battlefront announced they are printing more copies of #282 than normal to hopefully meet demand. The Live from Cold Wars ’11 episode of the WWPD podcast had an interview with Battlefront. The representative confirmed the new line. Basically it sounds like it will be a smaller effort overall compared to the WW2 line and there are currently no plans for blisters. All releases will be boxed sets. Battlefront expects Tropic Lightning to be used more as an occasional diversion by FoW fans and not so much a following all its own. Considering the one-sided nature of the war this is probably a sound expectation. The models will all release in April 2011. This entry was posted in 15mm, Flames of War, News and Updates, Vietnam.